The A List: Suit Up! Avid How I Met Your Mother lover and A List devotee Kyle Lichtman is here to bring you a special announcement about today's little known holiday. Enjoy! How I Met Your Mother—it’s the most awesome part of Monday. While there are countless HIMYM Barney moments to reminisce over, Barney Stinson’s first commandment and most common demand of his best friends is “suit up!”. In honor of “suiting up” and always looking awesome, October 13, 2010 is "International Suit-Up Day". Celebrating this new holiday is easy— all you really need to do is wear a suit anywhere you’re going today. Wear your finest to work, to school, out for a drink or even at home watching the game. In true Barney style, this currently well-dressed loyal follower urges everyone to SUIT UP! If you don’t trust me…trust Barney, “there’s no accepted substitute”…Nothing will suit you like a suit! 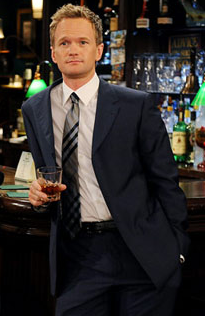 Editor's note: For those who don't watch HIMYM [myself included], find more information on InternationalSuitUpDay.com or SuitUpDay.com.